Oxford University Press. PAPERBACK. 0198073895 Brand New, Paperback , International Edition , Same text as US edition ,Different ISBN, Cover , printed in english , Ready to ship, fast delivery (5-8 busienss days ) worldwide . New. Oxford University Press. PAPERBACK. 0198073895 Brand New, Paperback , printed in english , Ready to ship, fast delivery (5-8 busienss days ) worldwide . New. Oxford University Press. PAPERBACK. 0198073895 Item in good condition.No Marking.Covers could be Little damaged . Textbooks may not include supplemental items i.e. CDs, access codes etc.. . Very Good. Oxford University Press. PAPERBACK. 0198073895 . New. Oxford University Press. PAPERBACK. 0198073895 Brand New Paperback International Edition. Fast Delivery. Same Contents as US Editions. ISBN and Cover might be different in some cases. Delivery in 4-14 Business days . New. Oxford University Press. Paperback. New. Oxford University Press, 2012. Softcover. Brand New. Orders usually ship within 1-2 business days. We use FAST SHIPPING via FEDEX/UPS/DHL and deliver within 3-5 business days with tracking number, no shipping to PO BOX, APO, FPO addresses. Kindly provide phone number for expedite delivery. 100% Customer satisfaction guaranteed! Oxford University Press, 2019. Paperback. New. Brand New, Never Used, IN-STOCK, Well Packed. Orders ship the same or next business day. Shipping should take from 3-4 business days within US, Canada, UK, and other EU countries, 2-3 business days within Australia, Japan, and Singapore. Customer satisfaction guaranteed. Mail us if you have any questions. Oxford University Press, 2012. Softcover. New. 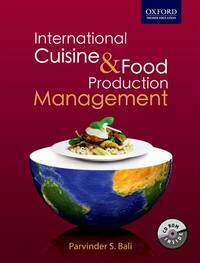 International Cuisine and Food Production Management is a comprehensive textbook specially designed for the final year degree/diploma students of hotel management. The book explores key concepts and illustrates them through numerous figures, photographs, and tables. Printed Pages: 560. Oxford University Press. New. Very good condition.